It’s fair to say that most of the DC films have not been good. From Man of Steel to Justice league and last year’s Aquaman, the films have been mediocre at best. Except 2017’s Wonder Woman, which at this point has been the best of the bunch, the whole entire shared universe has been a mess. So, it’s totally understandable if you assumed Shazam! would be added to the pile of mediocrity. Holy crap, you’d be wrong. Shazam! is pure fun and Joy from start to finish. Young Billy Batson (Asher Angel) has been bouncing around from foster home to foster home ever since his mom abandoned him. At his latest place, he finds himself living with a handful of misfit kids (Grace Fulton, Faithe Herman, Ian Chen, Jovan Armand), most notably, Freddy (Jack Dylan Grazer). Freddy, who got a disability where he has to walk with crutches, quickly tries to befriend Billy who wants nothing to do with him. He’s on a quest to find his mother and no school or foster family is going to stop him. Except for this one time. Billy reluctantly fends off a pair school bullies who have made it their mission in life to harass Freddy. After he puts them in their place, he hops on a local bus to continue his search. But he doesn’t get too far because the ancient Wizard Shazam (Djimon Hounsou) summons him thinking that he’s the only one that is pure of heart, the only one who can take over the mantle of being…. Shazam! Boy, was he wrong. And now is where the fun really starts. With the help of Freddy, Shazam/Billy learns to use his powers (in a hilarious sequence), which will help because he’s about to meet Dr. Thaddeus Sivana (Mark Strong), a super-villain who wants to take away Billy’s powers. Oh and, you know, destroy the world. 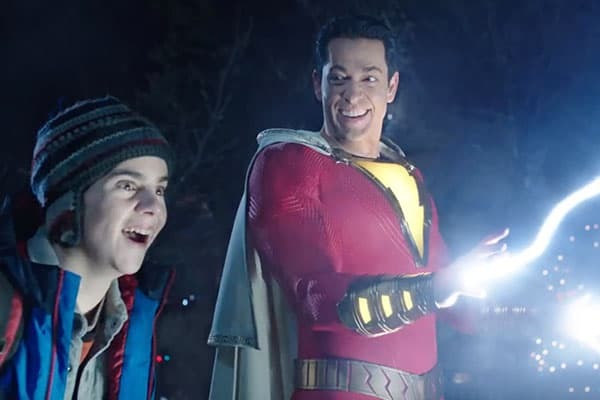 As Shazam, Zachary Levi is goofiness and super-hero rolled into one. Think of him as Tom Hanks’ Big character if he were given an extraordinary powers. Both he and Angel meld their characters together seamlessly and it’s fun to watch them move back and forth between the two, hero to kid and back again. And Grazer is the perfect Alfred (or is it Robin?) to Levi’s Batman (uh… Shazam!). While the cast is terrific, it’s really writer Henry Gayden and director David F. Sandberg’s vision of the film that should be commended. They bring freshness and a teenagers wide-eyed openness to the story, making it a blast from beginning to end.